Creon (generic name: Pancrelipase Capsules, Amylase/Lipase/Protease) is an approved pancreatic enzyme product for the treatment of cystic fibrosis, chronic inflammation of the pancreas and blockage of the pancreatic ducts. 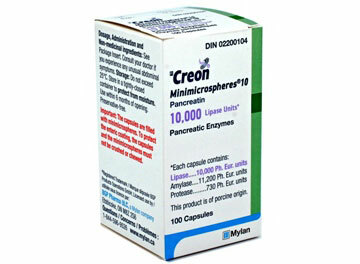 Creon contains pancrelipase, which is combination of three enzymes lipase, protease and amylase. These three enzymes are normally produced naturally by the liver, and they are very important for the digestion of fats, proteins and sugars in the body. Creon is prescribed to replace these enzymes when the body does not make enough on its own. Cystic fibrosis is an inherited disease, and is very common. It is caused by a gene which controls the movement of salt in the body, and the internal organs including the pancreas become clogged with thick, sticky mucus which leads to infections and inflammation making it difficult to breathe and digest food. The enzyme pills such as Creon helps cystic fibrosis patients to get more energy from the food that they eat. It does the same for people who have blockages and inflammation of the pancreas, helping them to digest food better. As with any drug, there may be side effects from taking Creon including nauseas, vomiting, stomach pain, upset stomach, greasy stools, diarrhea, constipation, rectal irritation, and bloating. If you experience any side effects you must seek medical attention immediately for safety. You should follow the instructions of the doctor who prescribed Creon to you. Directions and dosage information can also be found on the pack or leaflet inside the pack. Creon comes in capsule form. You should swallow Creon whole with a glass of water. Do not hold the capsules in your mouth for too long as it can cause irritation. If you have difficulty in swallowing the capsule you can open the capsule and sprinkle the content on a spoonful of apple sauce, but you must swallow the whole thing. Creon should be stored at room temperature away from direct sunlight and heat. If you are allergic to any of the ingredients of Creon, you should avoid taking it and inform your doctor. You must consult your doctor if you have any pre-existing medical conditions including a sudden onset of pancreatitis or worsening of chronic pancreatic disease. You must consult your doctor if you are taking any other medications as they may interact with Creon, including all vitamins and mineral supplements. It is important that you inform your doctor if you are pregnant, planning to conceive or breastfeeding as Creon may cause harm to unborn and new born babies.